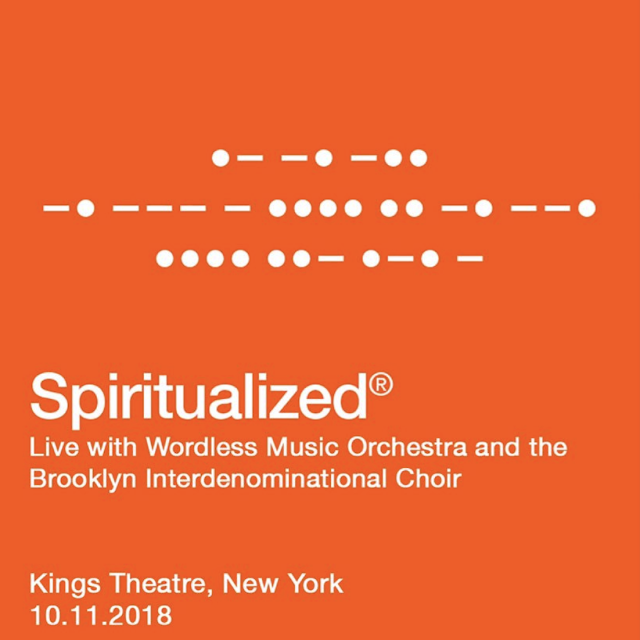 It's always an impressive move when a band can play a show and not have an opening act, but at this point in his career, J Spaceman, the leader and main man behind the iconic space-rock act Spiritualized, has established himself as an act that needs no introduction. Performing with the Wordless Music Orchestra and a gospel choir, it was clear that the show would be rather spectacular, but the events that unfolded were truly triumphant. Drawing from across their infamous discography, the night began with the heralded "Come Together" which immediately saw the crowd begin to rejoice in amazement and "Stay With Me" accelerated the evening into hyperdrive. Of course the setting only enhanced the show and felt like the most pristine and purposeful location for the band to unleash all of their glory. Lights danced across the theater and psychedelic images of jellyfish, inkblots, colored smoke, and shape-shifting patterns sparked the imagination, adding new depths to their already lavish orchestrations. After a third number from their masterpiece Ladies and Gentlemen We're Floating in Space, the band embarked on playing their latest release from start to finish. "A Perfect Miracle" and "I'm Your Man" were transcendent, the later of which featuring a guitar solo reminiscent of the classic Beatles track "Let It Be" which took the night to a new height and allowed the crowd to relish in the moment as the band continued to take the show to new levels of wonder. "On the Sunshine" and "The Morning After" showcased the band's jam styles, repeated rhythms that would erupt into pure noise freak-outs, giving the show a new dimension of sonic textures and further displayed the range and dexterity of their latest record. The encore began with "So Long You Pretty Thing" and it quickly became one of the most awe-inspiring and life affirming musical moments I've ever witnessed. It felt like total nirvana and rose to an unprecedented culmination of angelic vocals and near tear-jerking crescendos which felt larger than life. The feelings continued with "Oh Happy Day" as people rose to their feet and began to wail in the aisle, losing all sense of control, and totally surrendering to the music. If this does turn out to be the final run for this legendary act, there is no question that they're leaving everything onstage and exploding with total power. The magnitude of this performance was undoubtedly something that those in attendance will remember as not only one of the best shows of the year, but one of the best they're ever likely to experience. 09 "Here It Comes (The Road) Let's Go"
16 "So Long You Pretty Thing"